But come on. You wanna know how to find the best water ice wherever you are in Philly? Do this. Figure out where you are. Are you in Fishtown? In Center City? In South Philly? Okay, now turn around in a full circle. Did you see a place thats serves water ice? Boom. Best in your area. If you didn’t see one, walk fifty feet and try again. There are three reasons why I’m putting this first. 1) Because it’s a local outfit doing good work keeping Philadelphians cool this summer. 2) Because they have a rolled ice cream dessert served on a glazed donut roll (called a Tall Charlie) which may be the craziest thing I’ve ever seen done with ice cream. 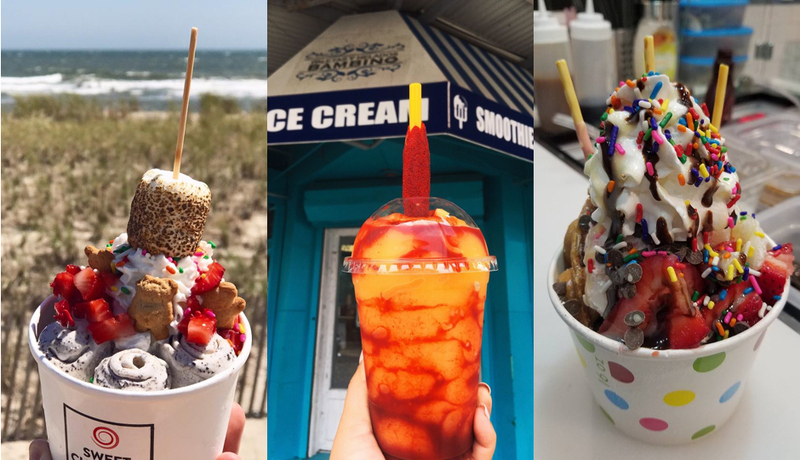 And 3) Because the Walnut Street location has a special section called “Sweet Charlie’s After Dark” which features boozy rolled ice cream for the grown-ups. This place can get crazy at certain hours, so you may have to wait a bit. But if you’re looking for a cool dessert that isn’t ice-cream based, this is your spot. The mango-raspberry is fresh mango, raspberries, custard cream and cold whipped yogurt topped with chocolate pearls and chocolate sauce, all wrapped up in a ridiculously large fresh crepe-cone. There are other options as well (plus various savory crepe-cones that can be…challenging to eat), but the mango-raspberry is perfect for a hot summer day. This is the real deal–Thai rolled ice cream made to order from a custom ice cream base (plus whatever weird things you want mixed in), and then formed into these chubby little rolled tubes right before your eyes on super-cold anti-griddles (metal plates that get down to -15 degrees). The place is generally packed with kids and families and teenagers all just hanging out in the cool environment at the Chinatown Food Hall, but trust me: It’s worth the wait. Here’s a weird one for you. Cendol is basically a cold dessert made of coconut milk, ice, palm sugar and rice flour jellies that look like green worms. It is strange, delicious, cold and awesome and you should absolutely check it out–particularly if you have kids. They’ll freak out if you tell them they’re having worms for dessert. Kind of like the Japanese version of rolled ice cream, except…not? I’m not really sure how to explain this one exactly, but it’s basically ice cream base, put into some kind of machine that turns it into a cross between frozen ice cream powder and threads of frozen, ice cream goodness. A bowl of it can come garnished with anything from mochi balls to adzuki beans to the kind of weird jellies that make up the cendol at Hardena. But hey, you know what it isn’t? Just another cup of water ice from that same place you’ve been going to for a hundred years. If you haven’t already been here, you are missing out on one of the greatest treats of the summer. Yes, there are lines. Yes, the milkshakes (offered in a few varities, all with nutty tehina as a base) sound unusual. But you gotta trust me on this. The Turkish coffee version is like drinking delicious chocolate jet fuel. The chocolate is rich and sweet and creamy without being syrupy or overpowering. And the best thing? If you can’t handle dairy, these things are vegan. No dairy used at all. It’s like the best magic trick of the summer. I will take a mango lassi over a water ice any day of the week. And Desi has the best mango lassi I’ve found in Philly yet–$3.50 for a tall glass of cold, sweet yogurt cut with smooth, blended mango. Traditional lassi are savory things, heavy on the spice. These are pure dessert. This Mexican ice cream shop in the Italian Market specializes in the chamoyada, an icy concoction of fresh mango smoothie and chamoy — a fruity, salty, spicy hot sauce. Make sure you get the “mega” version with whole mango chunks and gummies. The adorable food cart, pink and friendly as can be, pops up all over Philly throughout the summer — at farmers’ markets, at festivals, outside coffee shops. Its thing? Banana Jams — frozen bananas, whipped to mimic the texture of ice cream, and crowned with all sorts of fresh toppings like fruit compotes and coconut milk whipped cream. Cambodian Shaved Ice at Boba & Co. The big, red food truck in Lower Moyamensing has its own twinkly lit courtyard with tables, umbrellas and music. Go there for some of their atomic jerky, spicy, salty and addicting — and make sure you order some “Forbidden Shaved Ice” to go with (to cool your tongue). The Cambodian specialty gets topped with fresh fruit, basil and palm seeds, grass jelly, jackfruit, sweet red beans and a healthy drizzle of sweet, sweet condensed milk.